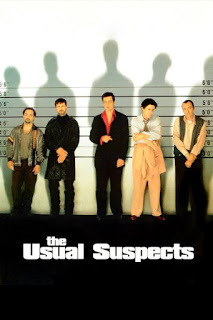 There’s always been something alluring about movies centered around crime, criminal involvement, mobsters, mafia and the underworld in general. That dates back, way back, to the 1930’s when directors, writers and producers decided to turn violent themed novels into short silent films. Over the years, through innovation and creativity, (much like in music) the genre evolved. Some twenty years later, in the very early 50’s, the subgenre “heist films” was born. This took the basic monotonous crime movies that were becoming repetitive and twisted it up. The concept of heists added a whole lot of thrill, unexpected plots and of course, some very exciting organized thefts. Over the years, the films in this subgenre got better, more intricate and gained a tremendous following. Personally, for me, crime, mafia/mobster movies have always been my preferred genre. In my early teens, I discovered heist films and I was hooked. This became my most favorite type of movie. When done well, it’s engaging, it starts off, sets up and unravels perfectly and always leaves you wide eyed and shocked and playing back what just took place. Today I get to talk my ten most favorite movies of this genre. The criteria I used was twists and turns, characters and plot, and of course the method to the robbery and I’ve included my favorite scene. With that said let’s look at the best of the best from a very extensive list (*please be mindful that this may include spoilers*). -For those who aren’t familiar with this movie, it’s about four magicians (The Four Horsemen) who perform magic shows, but rob banks and give the money to their audience. What makes this so great is the constant switch between an illusion and what’s really happening. They share some of their “secrets” that makes us believe it really is just a show, but the twist comes when a real bank in Paris is being robbed. There is not one dull moment and as soon as you (the viewer) think you know what is going to happen next, it switches up and you’re left wondering again and again. It ends with a great twist! 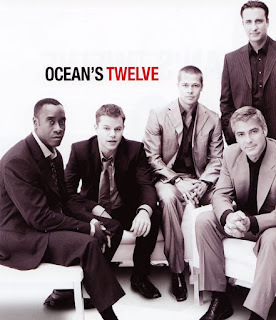 As for the cast, it couldn’t have been better. 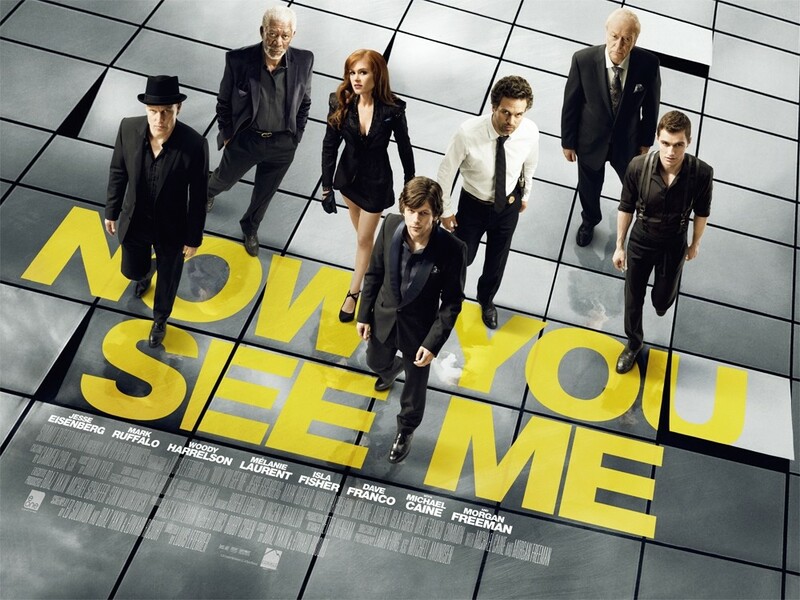 Isla Fisher, Jesse Eisenberg, Dave Franco and Woody Harrelson make up the magicians and Morgan Freeman is the illusion exposer, while Michael Caine is the millionaire sponsor, and Mark Ruffalo and Melanie Laurent are an FBI agent and Interpol. The casting was on point. Each group worked closely together amongst themselves and as a whole group so the dynamic and chemistry was noticeable and great. 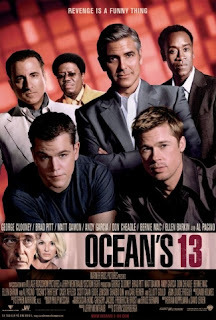 They each played their role in a believable way and executed a complicated and multilayered story very well. This is definitely a must see for those who haven’t yet and exciting enough to watch again for those who have. The magic show where they hypnotize audience members, ask the audience about their bank balance and bring the giant check with Tressler’s (Michael Caine) net worth total. They end up transferring his money to the audience one by one. The whole scene unravels quickly and keeps you on edge the whole way through. -Now this franchise gets critiqued A LOT for a few reasons. Not only is there an endless amount of them but the entire basis shifted somewhere along the way. From low level boosting of electronics out of delivery trucks and street racing for slips to the most current storyline of working with the FBI and global rogue agents, we’ve really seen it all. I personally love this franchise and I’ve enjoyed each and every one of them. 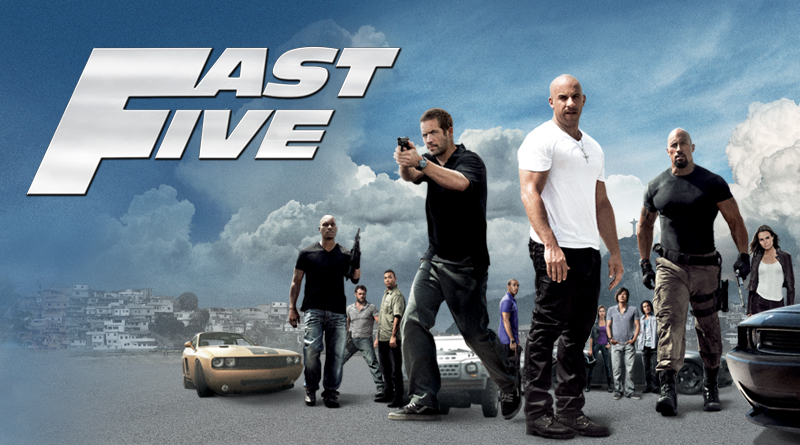 But Fast Five so far has been the best. Although this goes a little bit against my criteria of having a solid storyline, it still makes the cut. We see the crew in Rio, trying to pull of a heist of epic proportions: robbing the safe of THE crime lord of Rio. 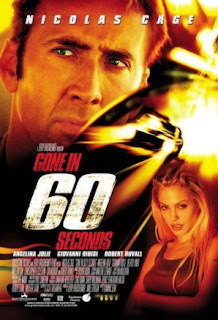 What I love about this (more so than the story) is the cars, the driving and the incorporation of the characters from the previous films and of course dragging an entire safe across the city. The cast dynamic is fantastic as usual and the references to past characters ties the stories together well. The Fast and Furious franchise (IMO) was intended to highlight incredible supped up cars, fast paced and exciting scenes and a storyline that was engaging. They definitely achieved this over and over and over again. The vault scene of course! The crew’s organization is incredible and so over the top that they have us rooting for them every step of the way! -This movie surprised me. I’m not a huge fan of Nicholas Cage but the fact that this was a heist film is the reason I watched it and I was pleasantly surprised. The cast is older and the actors/actresses are fantastic. 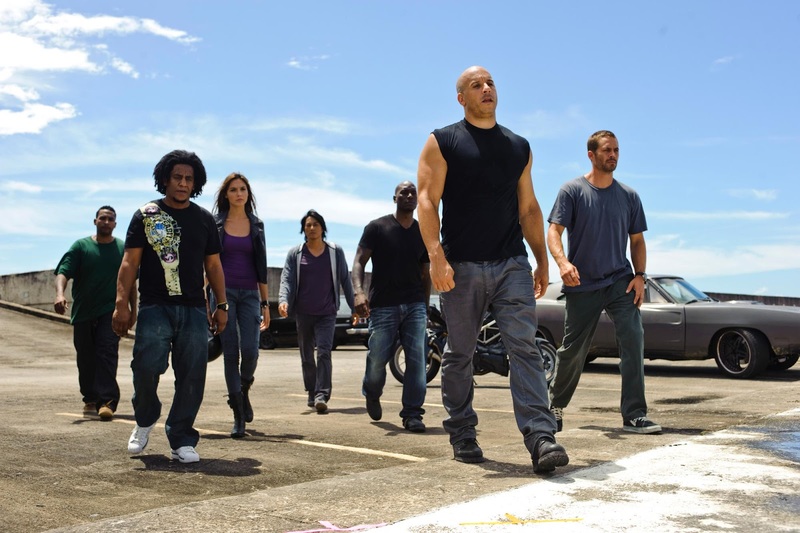 There is a great dynamic amongst them, as they bring humor, action, drama, and emotion perfectly. As for the story line, it’s simple but fantastic. Memphis Raines (Nicholas Cage) has to steal 50 cars in one night to save his brother's life. He gathers a team he’s worked with before and they begin the boosts and each car is named after a woman so you know the dialogue is going to be hilarious. We see some amazing cars, some amazing techniques and of course great dialogue. 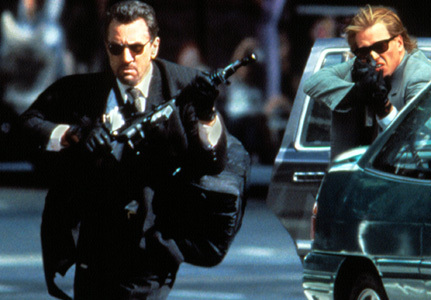 It’s a rough around the edges, classic heist film that keeps the audience immersed in storyline from beginning to end. 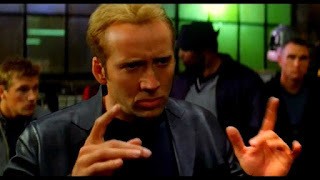 Donny (Chi Mcbride) is going to steal a car at night outside of a busy club when Memphis (nick cage) tells him “The ladies are dirty. Walk away”. The entire dialogue in that scene is hilarious and I love the humor. 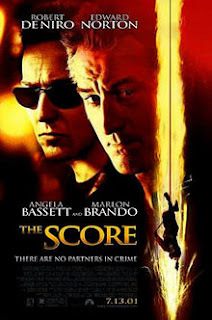 -This is another great movie, the cast is fantastic and the target was a bit different in this one: gold bars with the Balinese Dancer. From the start, it sounded important and it was treated as such the whole way through. What makes this a little different is the motive, they were avenging a death and taking a little for themselves. I think what made this so dope was that they were going up against their former ally. He knows their methods, he knows their strengths and becomes a bit of an obstacle. 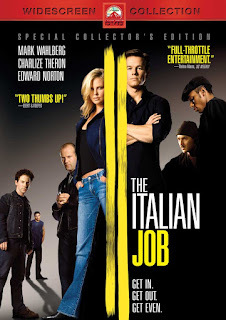 I think the casting was done perfectly also, Edward Norton, Mark Wahlberg, Mos Def, Charlize Theron and the rest of the crew’s characters were developed at such a great pace, the movie neither drags on or passes too quickly. Much like any good heist film, the scenes (especially the actual robbery) is perfectly in line with the story and unfolds perfectly. The heist itself. When they figure out the truck carrying the safe, along with the entire car chase and the mini coopers driving in the subway system. Of course, I also love the explosion that causes the truck to fall below street level and when they successfully break into the crazy “secure” safe. -Here’s a franchise that I wish would go on and on and on. Many people believe that with every edition it got worse, and I absolutely disagree with that. The first one was just brilliant, as robbing a Vegas casino on the busiest night from right under the owner's nose was epic and the way the second installment starts off ties the two together perfectly. Ocean’s 13 finds the crew back in Vegas and the entire character base is seen throughout the whole series, which makes it incredibly unified and tightly interwoven. The jobs are bold, the characters are relentless and they take down their target in the most creative and extravagant ways. This crew is the epitome of a team and they look out for one another every step of the way. 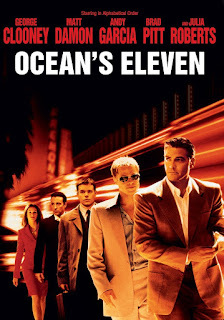 Ocean's 11: Yen being pretzeled inside of a cash cage cart and being deposited in the safe only to have his acrobatics come in handy to avoid all the sensors and alarms. Ocean’s 12: The end when we find out that Ocean’s team pulled off the job all along. I also loved the “dance” scene that Toulour does to avoid the light sensors. Ocean’s 13: When all the slot machines pay out at the exact same time and Willy Bank is left completely puzzled as to what is going on. -I don’t know where to start with this movie. First off, it’s based on a true story! For that alone, it deserves being in the top 5 but let me break it down. The angle of MIT students who are incredibly intelligent and using that as a “weapon” to count cards at blackjack tables is so dope. The rules are clear and make the anticipation of when they will break them exciting. I think the best part of this is the twist at the end, as it’s a story of the student outshining the teacher, but then turning on him too. Another great part for the viewers is that although this is clear theft, we are on the “villains” side the entire time. We want the casinos to lose, we certainly don’t want security to catch them and part way through we end up hating their teacher. They are students trying to advance their education and turn to this lifestyle to finance it. How can you hate on that?! Kevin Spacey, Jim Sturgess, Kate Bosworth and the rest of the cast were so believable and nailed each one of their roles. I couldn’t think of a better way to turn this real-life story into a blockbuster. The end when we think the counting team has retired, but we find out that they’ve continued and added Ben’s (Jim Sturgess) best friends to the group and they keep on playing the tables. 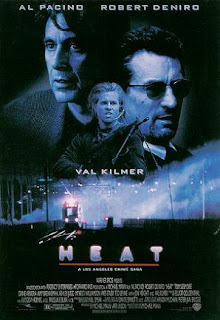 -Any movie with Robert DeNiro and Al Pacino in it will be on my top lists, but this clever plot puts them head to head as lieutenant (Pacino) and criminal (deniro). Deniro’s team steals everything from vaults and armored trucks to federal banks. These guys seem like they are untouchable and unstoppable. They live by rigid mottos like (and one of my favorite movie quotes of all time) “Don't let yourself get attached to anything you are not willing to walk out on in 30 seconds flat if you feel the heat around the corner” and they seem to pull off jobs flawlessly until they start getting lazy, which puts them on the police’s radar. 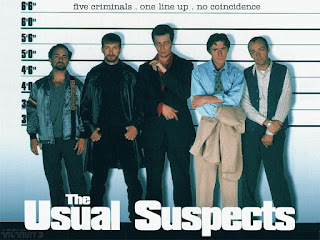 As the movie develops Neil (Deniro), the mastermind, falls in love with a woman and the entire operation goes sideways. I think that component is what makes this somewhat realistic: someone who lives in absolutes has to have a vice, which ultimately leads to his downfall. The ending is brilliant, with a full blown suspenseful shootout. I appreciate that the ending isn’t what we expect and to see these incredible actors close out the movie is great. The end scene at the airport. As much as it pained me to see Neil McCauley come out on top, he ends up being shot and killed by his adversary. The whole thing is nail biting and has you at the edge of your seat. -This meets the criteria of great heist movie to a tee. This one puts DeNiro on screen with Marlon Brando and Edward Norton so we know it’s going to be a phenomenal acting job from beginning to end. The plot here is a little less exciting than others on the list. A French sceptre is being smuggled to the US through Canada and held there, so it’s hardly an alluring target but the story plays out well (as expected). The veteran thieves are always one step ahead and secure their future enough that this really is their last score. Of course, the casting is great and as a result, this movie becomes a timeless classic. The Score was the last feature film Marlon Brando acted in before his death so for any fan this will always hold a significant place. The moment Jack (Norton) thinks he’s outsmarted Nick (DeNiro) and he realizes he’s been given a bogus sceptre instead of the real one. 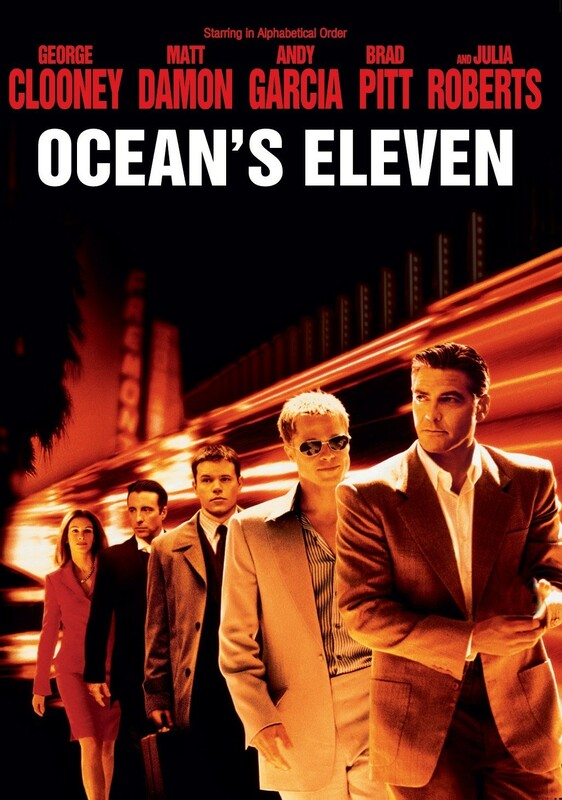 -This movie is one of the most well thought out and brilliantly executed storylines of all time. Essentially, this is a heist within a heist. 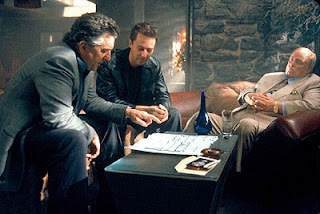 First, a group of conmen are brought in for police questioning for a crime they didn’t commit so they plan a revenge operation against the police. While this is the “main” storyline the layering begins when we are introduced to Keyser Soze, a legendary criminal mastermind. We quickly find out that these men have a commonality: they’ve wronged Soze and are forced to do a “pay back job”. Suddenly, the movie becomes so much more gripping. It doesn’t stop there, as this movie has the most epic plot twist, while the police are questioning Verbal Kint (Kevin Spacey), who has agreed to tell them everything he knows for immunity, we see that his story is 100% fabricated on the spot! 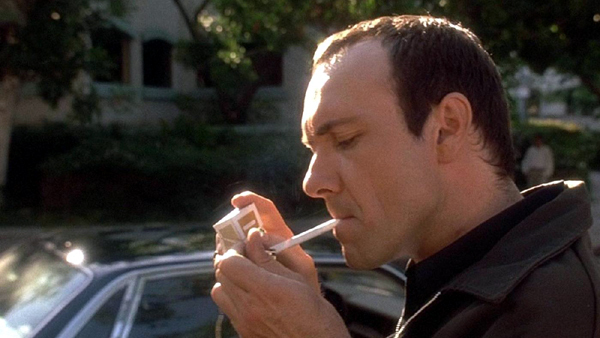 Keyser Soze’s name comes up quite a bit, but it’s always believed that he’s a made-up person. It isn’t until the very end that we get to see just how twisted it is. 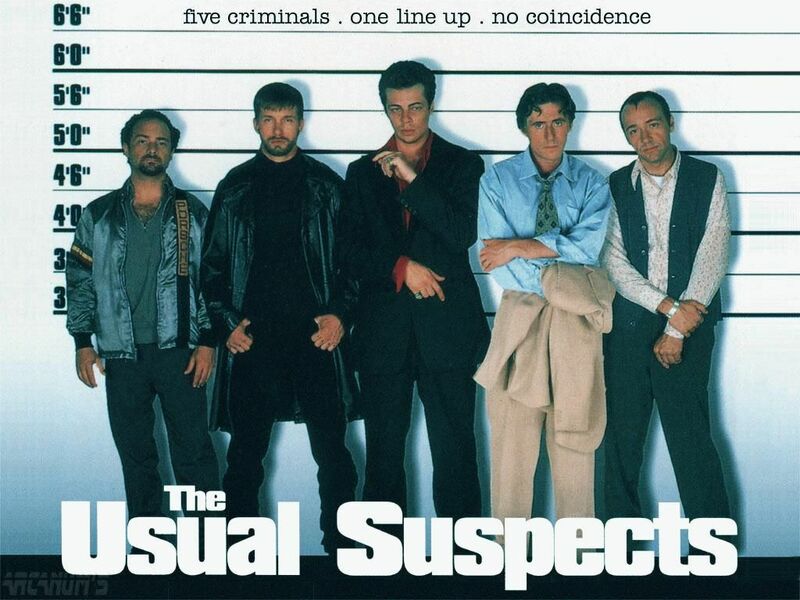 Verbal Kint is Keyser Soze and the truth of his story is left up to interpretation. As for the cast, it’s an older and much more seasoned cast which means we get much better acting and believability. 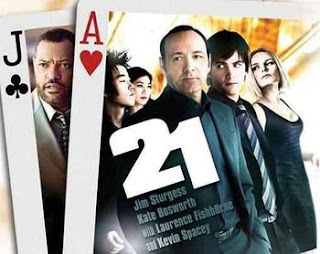 The cops play their part well and the conmen do the same but Kevin Spacey kills this role. The end when Verbal Kint finishes telling the cops his version of the story in questioning and the sketch of Keyser Soze comes in and it was Verbal all along. As the cops run out to get him, we see him limping down the street, as he walks the limp straightens out and his driver picks him up. The last line we hear is “The greatest trick the devil ever pulled was making people believe he didn’t exist” (it really doesn’t get better than that). 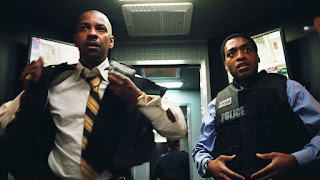 -The best heist movie ever made. It’s narrated and told from a person who masterminded the entire operation and we’re about to find out just how elaborate and well put together it was. Why this is so great is because it’s the “jack of all trades” movie. Not only is it a heist, it’s a hostage situation, it’s action packed and it’s a suspense thriller. 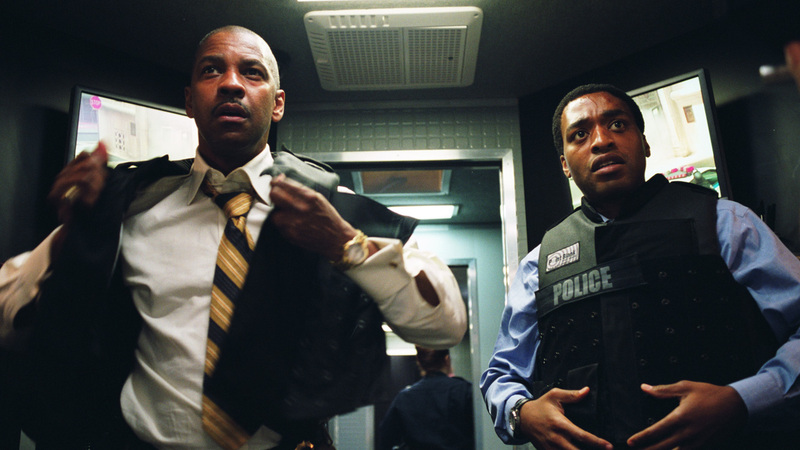 The cast is perfect (usually movies with Denzel are) and the dialogue is flawless. Since the robbery happens in broad daylight, it wastes no time getting into it and within 10 minutes we (the audience) are hooked. The robbers are dressed in painter’s clothing and they force everyone else to dress the same way. We don’t understand it at first, but it doesn’t take long before we learn that this is what ultimately throws the police for a loop and makes it impossible for them to differentiate civilian from criminal. The target is documents proving that the bank was founded on the money Nazi’s took from the Jews. As the film goes back and forth from the robbery to the police questioning of each person we realize how well put together this operation is. 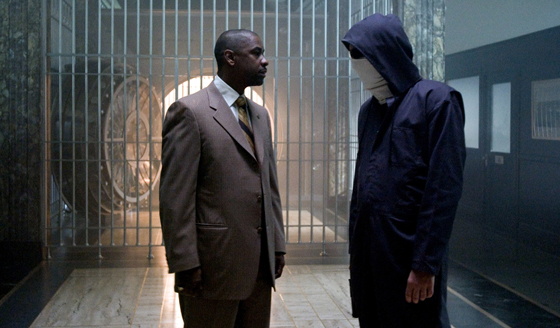 Oddly enough, my two favorite scenes are the beginning when they enter the bank and the end when Dalton Russell (Clive Owen) walks out of the bank bumping in to Denzel and showing him the diamond from the deposit box, which confirms that he is the robber. 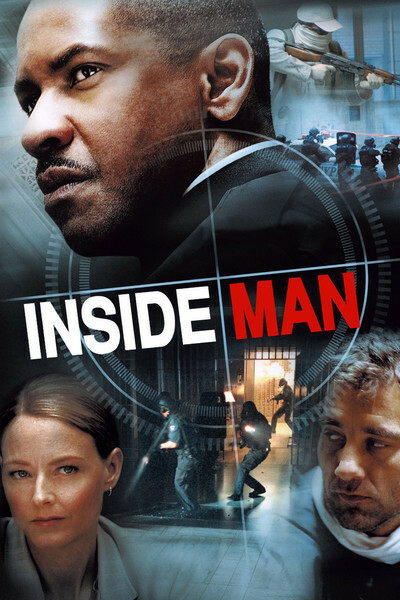 This subgenre of crime/heist movies will always be intriguing to us because they are intricate plots that unravel fast, are filled with action and are so clever and when done well they follow a formula but still manage to leave is in shock and awe. These ten movies do exactly that, as they are truly the best and regardless of how many times you watch them, they are just as entertaining.